Unasylva is published quarterly in English, French and Spanish editions. Subscription price: one year US$26.00, payable to the Sales and Marketing Group, FAO, Viale delle Terme di Caracalla. 00100 Rome, Italy, or to any of the FAO sales agents listed on the inside back cover. Material not copyrighted may be reprinted with credit to Unasylva. FAO. Credits. 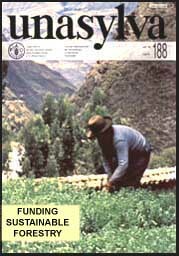 FAO (cover photo); R. Pardo (page 4); FAO (6); United Nations (8,9); FAO (13 upper); M. Guimaraes (13 lower); D. Hulse (15); J. Nations (17); T. Dardani (18); D. Henry (21); T. Kelly (27); FAO (29); UPA Colombia (32,33,35); L.J. Castaño (36,41,42); C. Palmberg (50); J.-P. Lanly (52).